Beautiful smile, deep throaty belly laugh, eyes that sparkle and energy that could run New York City that’s Tracy Merry-Thomson. There are a few other descriptors like mover of mountains, determined, single focused, big hearted and generous. I could go on but you may think I am talking about myself! I have had the pleasure of becoming a friend of Tracy’s. How? Through clowning of course. She came into my store Clownin’ Around Magic Shop in Vancouver Canada and met with the man who works with me for the last 12 years Joe. Joe showed her magic tricks that she could do and be successful at and gave her ideas for presentations. Joe gave her good advice. Joe also spoke highly of his boss (that’s me, Amanda O’Leary) and Tracy was intrigued, but I am getting ahead of myself. Tracy is part of the Edmonton Caring Clowns troupe in well Edmonton Alberta. Only in the craft of clowning for 3 years now, Tracy is a veritable baby in clown years. However, she has a natural talent for performing and making people feel special. Her training in marketing and sales certainly help in her ability to meet and greet but I tell you there is something far deeper. Tracy is truly a caring clown with great energy and enthusiasm. So what’s so special? Tracy has MS. (Multiple Sclerosis) And true to her form it’s just not the regular strength MS – oh no, she had to go for the super-duper really painful and debilitating strain. This is so typical of Tracy – why do anything in half measures. She was diagnosed some 10 years ago after some routine medical exams because of a car accident. (Not her fault by the way) Whether the accident accelerated the disease but her symptoms went quickly from dragging her one leg to using a cane to a wheel chair in a matter of months. You could only imagine the emotional work that had to be done to get your mind around being a successful businessperson to being on long term disability in short order. Add into the mixture a rare life threatening (read the doctors telling her “say goodbye to you son he won’t make it through the day”) autoimmune disease called Wegner’s Granulomatosis that ended with her son receiving a double lung transplant. Again, just like his mom! Why go for one when you can get a double lung transplant? I can’t imagine the heart ache and fear and praying that went on at that time. How could someone experience in a short amount of time such heartache, such devastating news, such life altering events and still smile? Let alone get off the couch, throw on a clown nose, grab a motorized scooter and go entertain those with less? Those with less? This woman has pain daily, her mind slows after noon – as Tracy says she has the Cinderella Syndrome – her head turns into a pumpkin at noon, she faces her legs giving out at anytime because of MS and falling to the floor. Somewhere she has re-framed her situation so she has more. She has “more” to give, more attention, more love, more fun, more energy, more laughter, more hugs. She gives to those in a senior’s home that have nowhere to go, maybe no one to visit them, maybe too sick to enjoy the monthly birthday celebrations. Tracy was visiting in her local senior’s home and asked why this birthday person wasn’t in the crowd. “He’s too sick” was the answer. Then the party will go to him. Off she wheeled her scooter towards his room. She sang him happy birthday, gave him a balloon and made his day. Others wouldn’t have thought to take the party to the sick person. Tracy knows it has to come to them. It is only with sheer determination and headstrong will power that Tracy or more to the point her alter ego “Happy” shows up some days because her disease has such a hold on her. 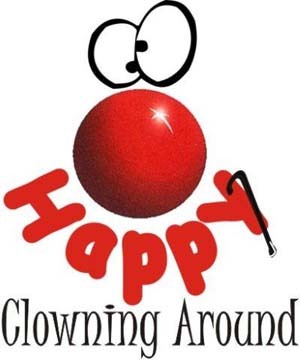 She puts on her costume and clown nose and regular make up and heads out in her van as Happy a Caring Clown. The interesting thing is when she is performing as Happy, she doesn’t hurt. When she performs magic as “Happy” she’s on target. When she performs as “Happy” aside from thinking she’s too lazy to walk (‘cause she has a scooter) people wouldn’t know she’s afflicted with such a debilitating disease. Others would be at home with the covers pulled over their heads. Why did she put a year of her life building, designing, doing the artwork, taking pictures, and dragging me into helping her finish the project? Because there was no such resource for clowns. A void had to be filled, a job had to be done and Tracy was just the clown to do it! Visit the page, there is so many ideas and it’s all there to use. Tracy is quick to point out that many people have helped her with this Facebook project, many of them non-clowns. People who went and did the legwork, the shopping for things, the picture taking, all the things that have to get done to get things done. Tracy especially wanted to thank Margaret Nowak and her daughter Marysia. Margaret volunteers 1 to 2 days a week helping Tracy with all her clowning and non-clowning projects. I told you she was generous. Tracy knows the value of volunteering. What she receives back is far greater than what she gives out (according to her). Volunteering at a seniors home isn’t for the feign of heart. It’s hard work and sometimes the value of your visit isn’t discovered until you have left. There are few too many people to go around and way too many people who need visiting. These people who were once vibrant and useful are now shells of their previous self. It is sad. However when you connect and listen to the seniors’ stories, their eyes begin to sparkle as they relive their glory days. Who doesn’t shine brighter when the spotlight is turned on themselves. Let me leave you with a quote from Tracy “If I concentrated on what I can’t do instead of what I can do, I’d never get out of bed”. Accent the positive, find your passion, reach out to others and never forget how to laugh, especially at yourself – the rewards are amazing. Here’s to my friend Tracy Merry-Thomson, may we learn to be more like her.